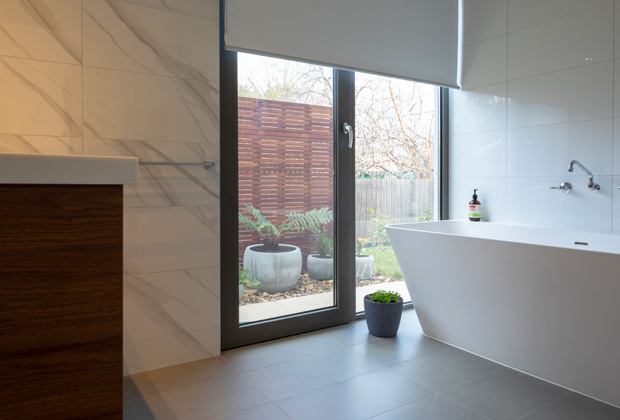 This new house was designed with the goal to create a space that was inviting, fresh and contemporary, while simultaneously environmentally conscious. 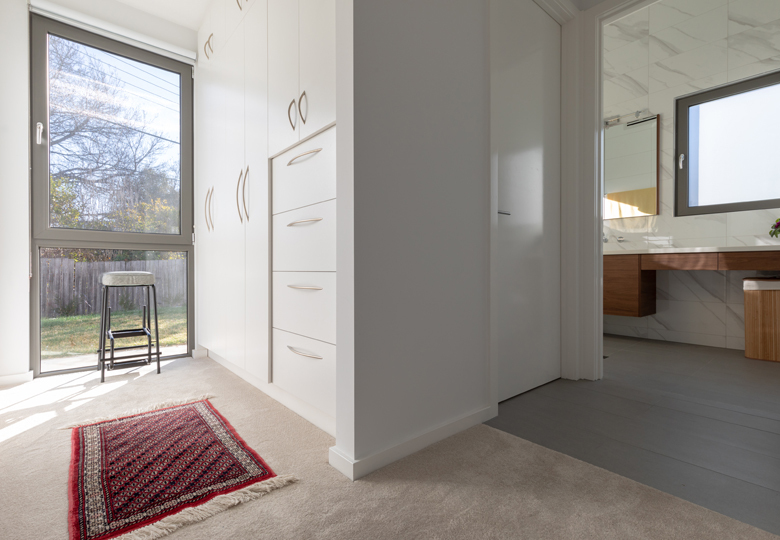 This project involved the construction of a new, single level, energy efficient, solar passively designed home in close proximity to existing suburban infrastructure. This involved an extensive search for the right block before finally finding the site in Downer – a short distance from the Dickson group centre. 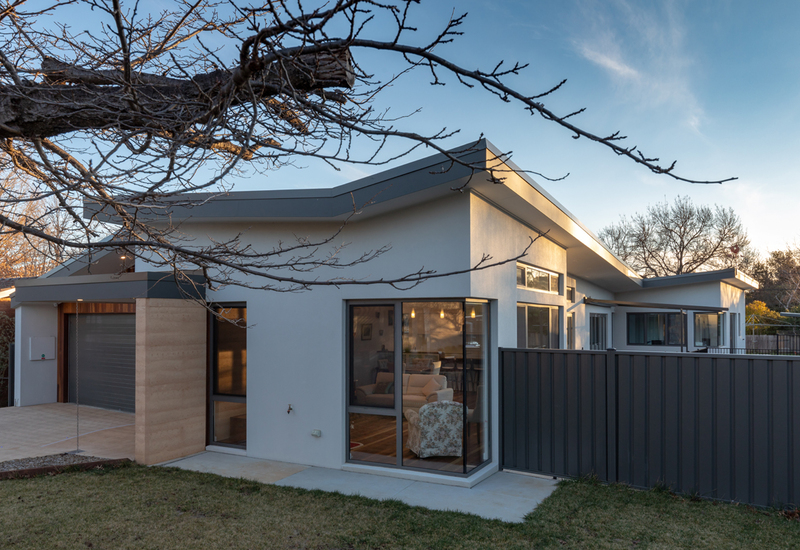 The project involved the demolition of the existing small brick veneer bungalow on an ~800 m2 east-west orientated block in a small cul-de-sac. 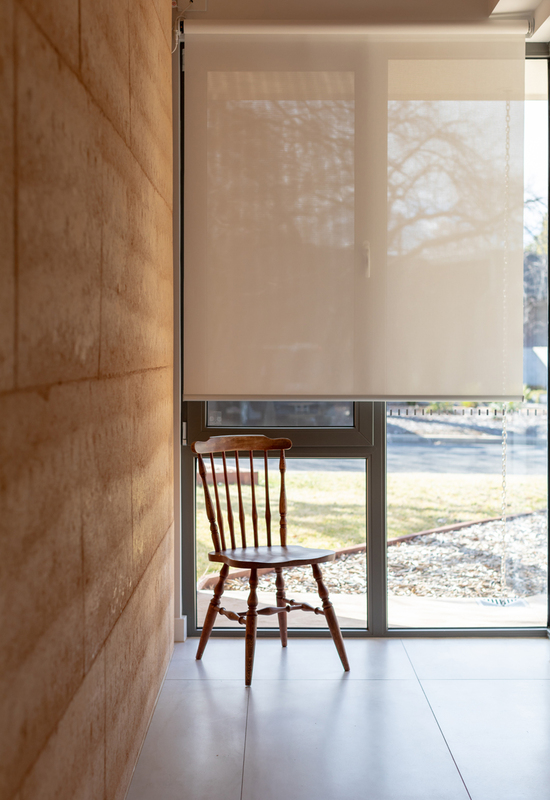 Utilising the long northern side boundary, the new house locates all main living areas and master bedroom to the north, while the garage, ancillary rooms and secondary bedrooms are located on the southern side, with all rooms accessed off a central spine. 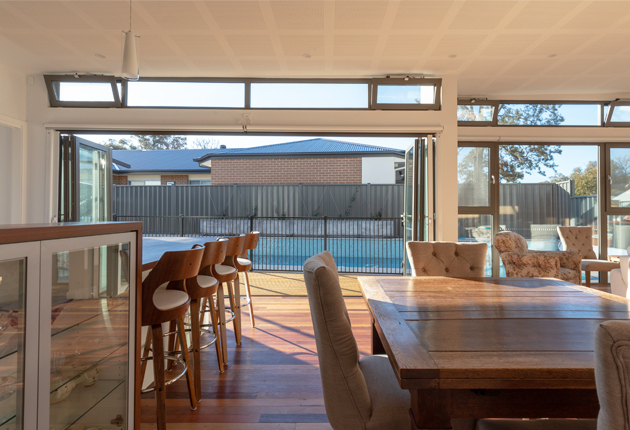 The house opens out to a northern courtyard with lap pool and outdoor entertaining area. 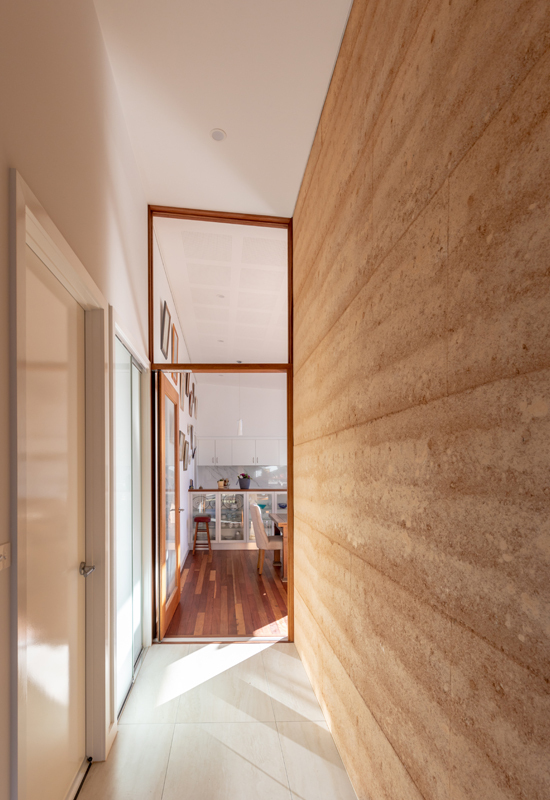 A central feature of the home is the large rammed earth blade wall that acts as both a dividing wall between the entry and living area and thermal mass to store heat in winter and cool the home in summer. The rainwater tank is used for toilet flushing and laundry as well as servicing a produce garden located at the western end of the house. 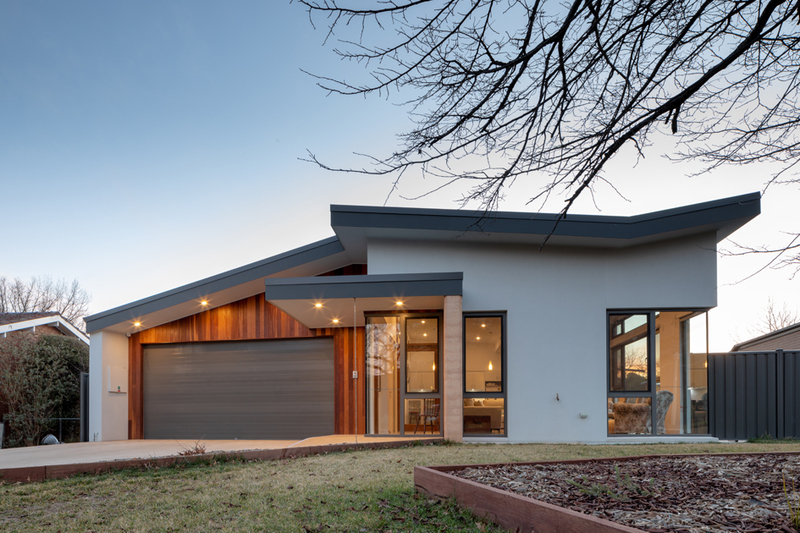 The butterfly roof form collects all but the garage roof rainwater in a central gutter and rain head at the western end of the house into a 10,000 lt rainwater tank. This design form creates a northern pitched roof for the large 14kW photovoltaic solar array and solar hot water system, while high level double glazed uPVC windows and large bi-folding doors maximise the northern sun in winter, while extended eaves and retractable awning provide solar protection in summer.